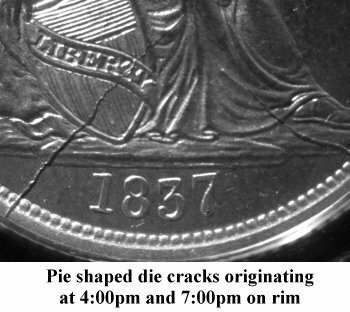 Comments: During its final die state, Obverse 1 shows multiple pie shaped die cracks that are bold and clearly visible. The die cracks at 4:00 and 7:00 continue to worsen while a new die crack is forming at 1:30. 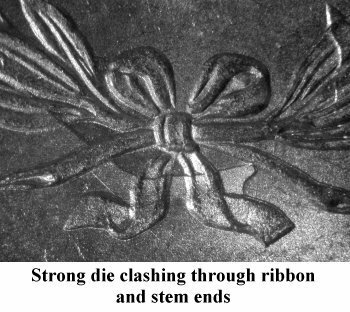 Significant die clashing is evident on both Obverse 1 and Reverse A dies. 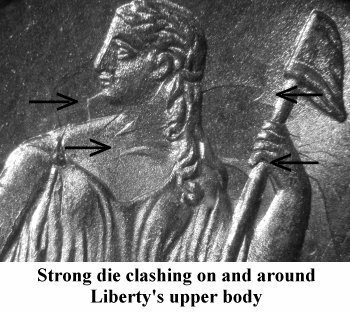 Obverse die clash marks are obvious on and around Liberty's upper body from a severe clashing event with Reverse A. 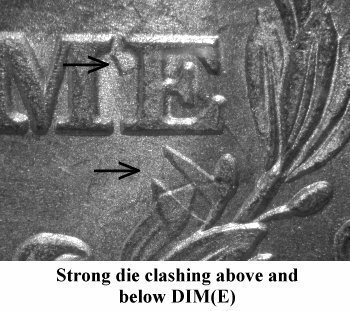 On Reverse A, strong die clash marks are visible around DIM(E) and through the ribbon and stem ends. When comparing Obverse 1 and Reverse A clash mark locations, please remember that the dies were rotated by approximately 25 degrees during the clashing event. During December 2009, Donald Bennett developed a graphical analysis method with CamStudio freeware to overlay the Variety 101 dies and clearly demonstrate the reciprocating clashing on obverse and reverse dies. Donald's .avi formatted movie can be download here and launched with Window Media or Quick Time players. After striking limited quantities with this heavily clashed obverse, the mint retires Obverse 1. 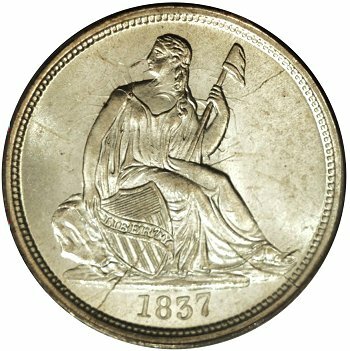 Reverse A will be paired with a 1837 Small Date obverse creating Variety 104. 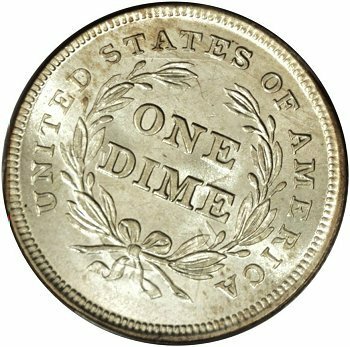 Examples of Variety 101c die state are difficult to locate and considered to be very scarce. Considerable patience and searching are necessary to locate a high grade example. The plate coin is the finest Variety 101c example known to the author.